It's book fair season and that should be a good thing but for those of us whose kids immediately do a beeline for the "non-book" items, it's not nearly as pleasant as it used to be. In fact, this annual school fundraiser just might need to change its name to "Books and Random Crap Fair." Yup, that would be a much more apt description of the modern book fair. It's already tiring enough to explain, again, why you will not buy your 7 year old the $40 hardcover 'History of the Light-saber'. And then there's the inevitable rhetorical asking of, "really, you want another Power Rangers book?" It was already bad enough that they sell books that come with a lego figure. I mean, do they know how many times in a span of two minutes a child can ask for that book? But now, the powers that be, those lover of books, have decided to load up the fair with so much stupid crap. And by crap, I don't mean bad books. I literally mean the annoying kid crap that drives all parents crazy, like 20 inch pencils wrapped in feathers, pens shaped like hover-boards, and flashlights that double as calculators shaped like cell phones. In a word, the fair is full of way too much junk. Unfortunately, the trip ended with me hauling my screaming 4 year-old out of the library because they had no copies of the Frozen book she wanted. My toddler managed to push about 40 books off a table that was also crammed with novelty erasers, key chains, and other junk. (Upon returning home, we found one such key chain in my daughter's still-clenched fist that we had not paid for.) 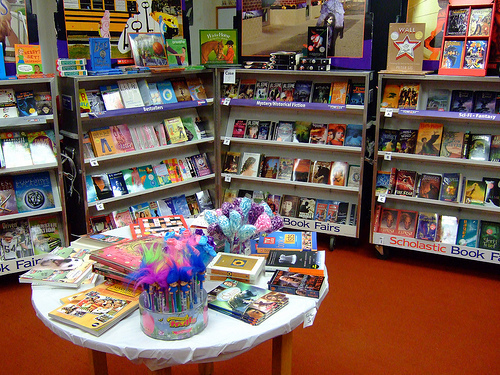 Why does a book fair sell key chains, erasers, etc.? Isn't a book fair intended to find great books and encourage reading? All the non-book stuff distracts kids, and redirects Mom and Dad's money to trinkets that don't promote reading. A book fair is supposed to be about books. It's a unique opportunity to support our children's school(s) financially while also purchasing something worthwhile and educational. A book. So I beg you. Fight back against the pressure to sell all the sparkly trinkets. Ya know, the dumb stuff. It makes the book fair frustrating for far too many parents and shifts the focus of the kids from picking out something cool to read to vying for the title of "most annoying and relentless kid on the planet." It makes a trip to the book fair no different than a trip to Target with kids in tow where they fixate on and beg for some super lame thing they won't even want an hour after their sucker Mom (or Dad) buys it. Do this for us and I promise, we'll spend a little more at the fair as a thank you for giving us back our sanity and helping us to not be THAT mom screaming the word 'No' at the book fair.